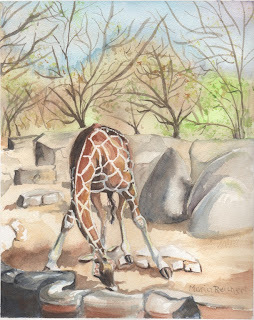 I wanted to share a watercolor painting, 8 by 10 inches, of a young giraffe from the Columbus Zoo. This little painting was a bit of a struggle as I muddle through rocks and trees and backgrounds, the animals are so....much easier. I liked the soft colors of Spring and the strong sun and shadows and this is the picture I came up with. I think I will head to some of your blogs to study your trees, I find them (the trees) very challenging, whether up close or further in the background. Too many branches! I am thinking something simpler for my next painting. I haven't tackled rocks and boulders yet...but can see how their shapes, shadows and colors could be a challenge. As far as trees go, I've found the less detail, the better. Although I haven't mastered painting them in watercolor. I'm pretty comfortable with pen and ink trees. During my boys soccer practices I practice trees since the fields are surrounded by them and there really is nothing else to draw. Your comment on my blog today was so great that you deserve a book. 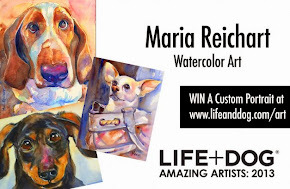 Send me your mailing address, and I'll be glad to send you a coffee table book of my work. Email me at jmkohler@markkohlerstudio.com.